Afternoon and an update for everyone. Weather wise we are in a relatively calm period which is great if your a cyclist but no good if you want to go sailing. The warmer weather has brought people out of the wood work and boats are already starting to go back into the water. Since lock closure we have been busy with other maintenance around the marina. More rock armor has been put in at the north end of the sea wall for extra protection of the bank. The ablutions have been deep cleaned, some new flooring laid etc. 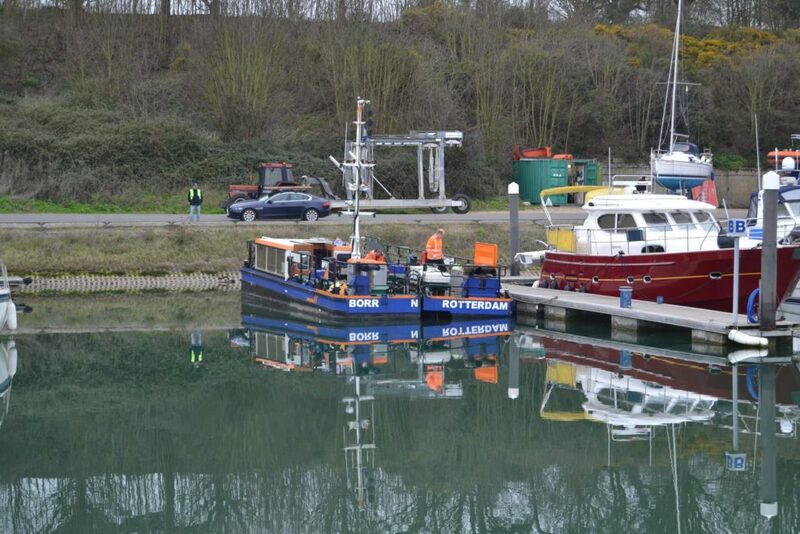 A new travel hoist has been bought by the marina and the old one dismantled and taken away after many years service. The new hoist has a remote control so don’t be alarmed if you see it going along on what appears to be its own, Craig or Andy will be near by keeping an eye on it from various angles! Richard Ireland our longest serving lock master retires this week after many years service. I know a number of you have been very generous with donations towards his leaving presents. He will be sorely missed. Matt Winters is his new replacement and is already in place fully trained and ready to go. He comes with a wealth of experience having worked on board at Trinity House. Finally today’s picture is of the Van Oord injection dredger Bor prior to being lifted out onto road transport. She has been dredging in the harbor including our approach channel.